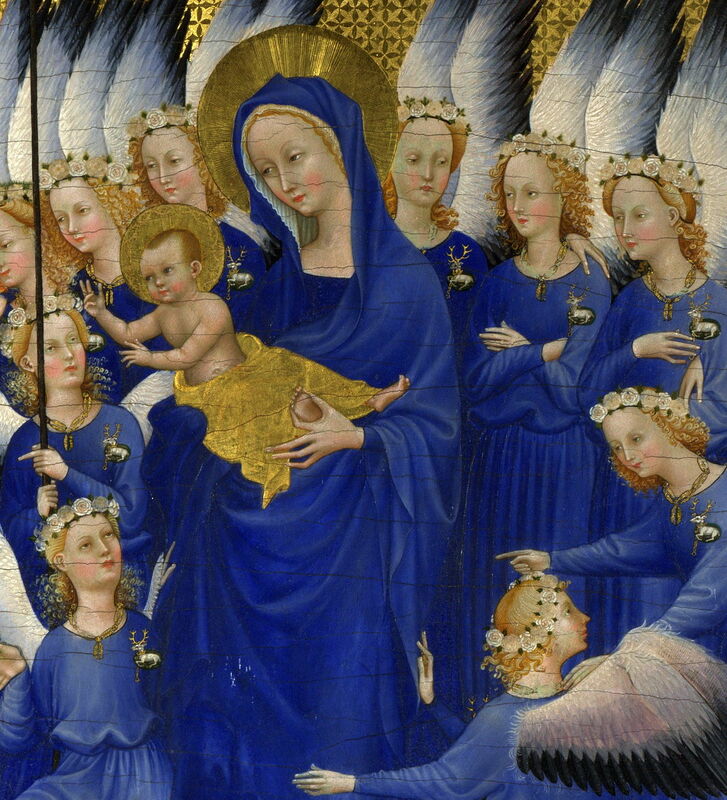 Anonymous, The Wilton Diptych (detail of inner right panel) (c 1395-9), egg tempera on panel, each panel 53 x 37 cm, The National Gallery, London. Wikimedia Commons. If you’ve ever left plates coated with egg around for a while, you’ll know how difficult egg residue can be to remove. No one knows when people first took advantage of this in paints, but earliest surviving examples are from late classical times. By the Renaissance, egg yolk was popular as a binder in artists’ paints, and the technique of egg tempera was used to create many of the masterpieces of the day. Pure egg tempera technique uses the proteins, fats and other consituents of the yolk of fresh hens’ eggs as its binder; being water-based, water is its diluent. Applied thinly to an absorbent ground such as powdered chalk in a gesso, this quickly sets to form a hard if not brittle paint layer which – unlike glue tempera – can’t readily be removed by water. Because egg tempera forms such a hard paint layer but is applied thinly, it is prone to cracking unless the support is rigid and doesn’t change dimensions over time. Early egg tempera paintings were almost exclusively made on wood, but more recently stretched canvas has been used instead. That can lead to cracks and eventual mechanical failure of the paint layer. Egg tempera on wood panel was the favoured combination for easel paintings (as opposed to fresco for walls) during the early Renaissance, particularly in Italy. The finest paintings in egg tempera use only fresh eggs; as eggs age, particularly when they’re not refrigerated, separating the yolk becomes more difficult, and the resulting paint layer doesn’t appear as strong. Since the nineteenth century, some paint manufacturers such as Sennelier have offered tubed paints with egg as its main binder, but with the addition of some drying oil forming an egg-oil emulsion. These have some of the properties of pure egg tempera, but are more versatile in their handling, and can be used like gouache and even, with care, like oil paints to a degree. These appear to have been derived from recipes recorded during the Renaissance. 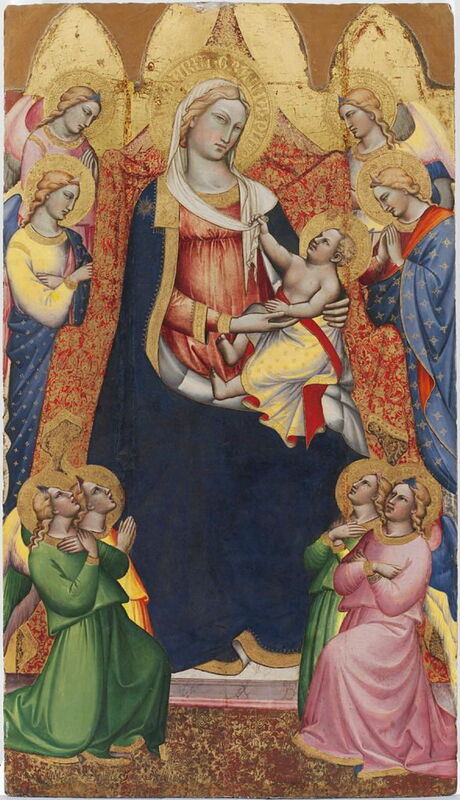 Margarito d’Arezzo (fl c 1250-1290), The Virgin and Child Enthroned, with Scenes of the Nativity and the Lives of the Saints (c 1263-4), egg tempera on wood, 92.1 x 183.1 cm, The National Gallery, London. Wikimedia Commons. 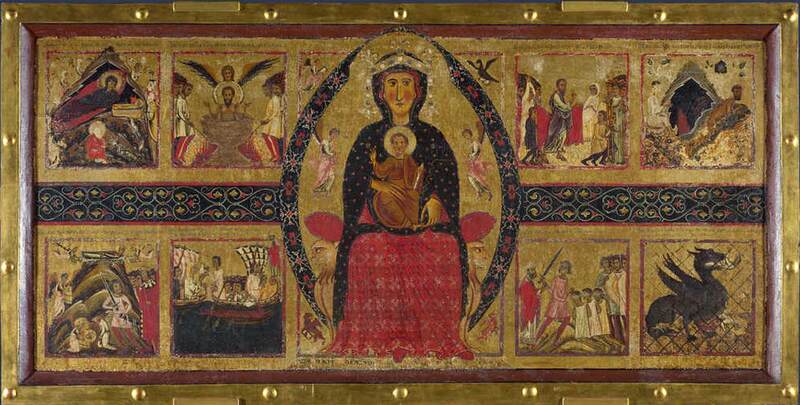 Earliest European examples of egg tempera, such as Margarito d’Arezzo’s The Virgin and Child Enthroned, with Scenes of the Nativity and the Lives of the Saints from the middle of the thirteenth century, often incorporate extensive gilding and appear ‘primitive’. As I will show later, there is nothing inherently ‘primitive’ in the medium. 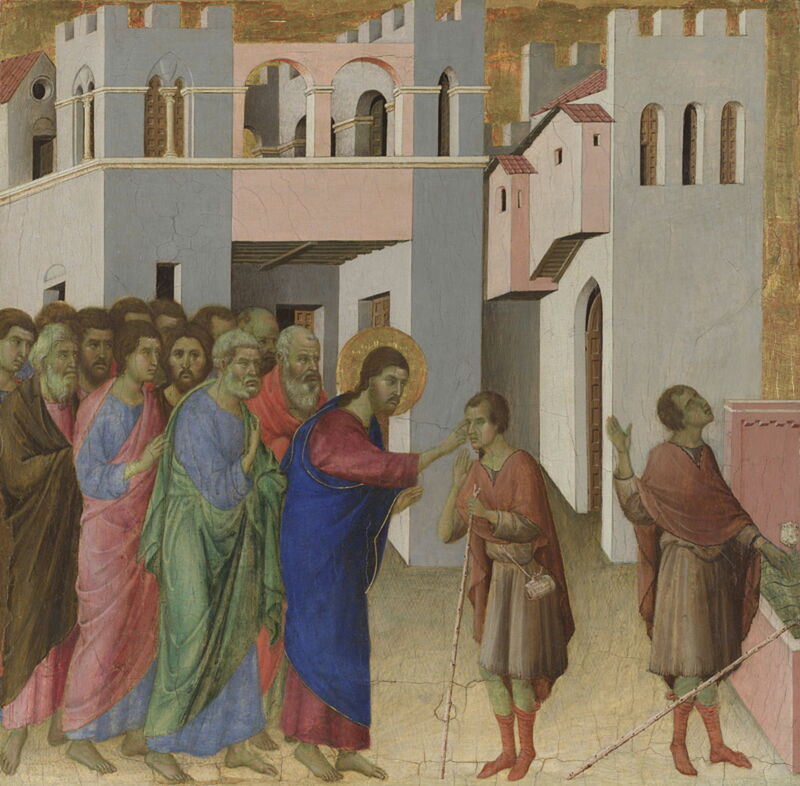 Duccio (fl 1278-1319), The Healing of the Man born Blind (Maestà Predella Panels) (1307/8-11), egg tempera on wood, 45.1 x 46.7 cm, The National Gallery (Bought, 1883), London. Courtesy of and © The National Gallery, London. Even early paintings in egg tempera can be remarkably well preserved, such as Duccio’s Healing of the Man born Blind from the early fourteenth century. Although only a thin paint layer, the egg yolk is sufficient to preserve high levels of chroma in the pigments. Spinello Aretino (1350/52-1410), Virgin Enthroned with Angels (c 1380), tempera and gold leaf on panel, 195.3 x 113 cm, Harvard Art Museums/Fogg Museum (Gift of Mrs. Edward M. Cary), Cambridge, MA. Courtesy of Harvard Art Museums/Fogg Museum. As the modelling of flesh and clothing became more realistic, egg tempera proved more than sufficient for the task. 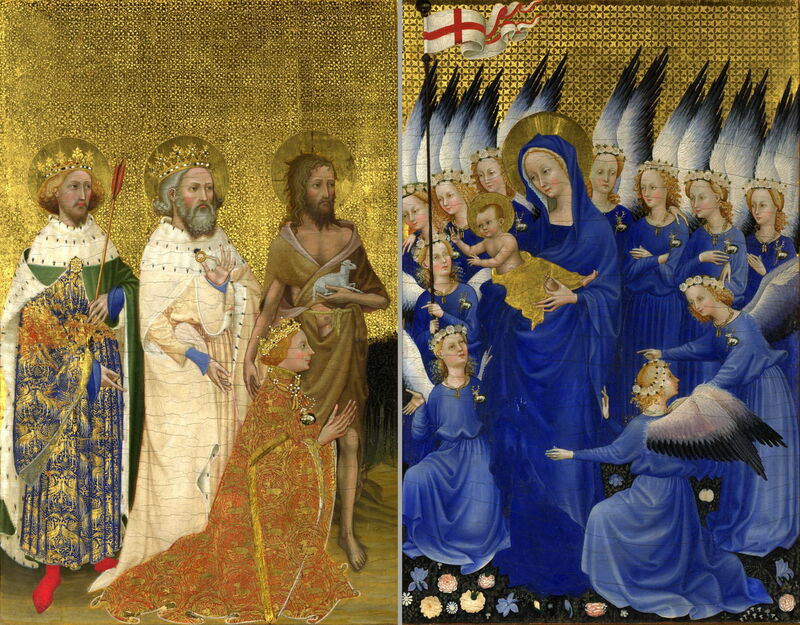 Anonymous, The Wilton Diptych (c 1395-9), egg tempera on panel, each panel 53 x 37 cm, The National Gallery, London. Wikimedia Commons. One of the finest early works painted entirely in egg tempera is the anonymous Wilton Diptych in London’s National Gallery. Thought to have been made in France at the end of the fourteenth century, its exquisite detail would have been painted in multiple thin layers using fine brushes, much like the miniatures painted in egg tempera on vellum in the previous centuries. Masaccio (c 1401-1428/9), Saints Jerome and John the Baptist, from the Santa Maria Maggiore Altarpiece (c 1428-29), egg tempera on poplar, 125 x 58.9 cm, The National Gallery (Bought with a contribution from the Art Fund, 1950), London. Courtesy of and © The National Gallery, London. But it was in Italy that painting in egg tempera reached its apogee, with masters like Masaccio, in his Santa Maria Maggiore Altarpiece from about 1428-29 (above) and Piero della Francesca’s Baptism of Christ (below) of a decade later. 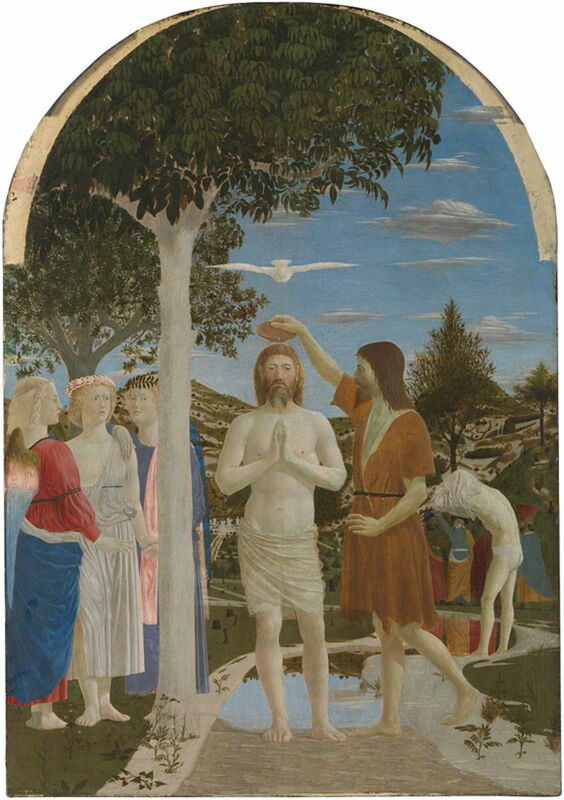 Piero della Francesca (c 1415/20-1492), The Baptism of Christ (after 1437), egg on poplar, 167 x 116 cm, The National Gallery (Bought, 1861), London. Courtesy of and © The National Gallery, London. During the fifteenth century, egg tempera was progressively replaced by oils in Italy, as it had been earlier in the Northern Renaissance. Paolo Uccello (c 1397-1475), Niccolò Mauruzi da Tolentino at the Battle of San Romano (c 1438-40), egg tempera with walnut oil and linseed oil on poplar, 182 x 320 cm, The National Gallery (Bought, 1857), London. Courtesy of and © The National Gallery, London. 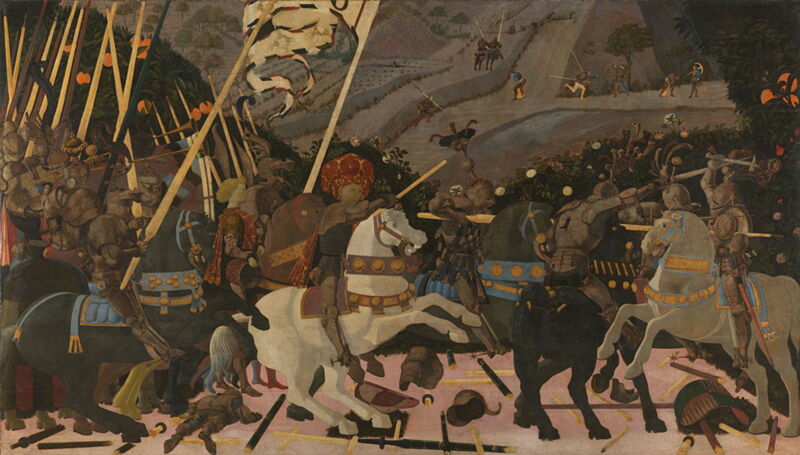 Uccello’s large panel of the Battle of San Romano incorporated some drying oils, including walnut and linseed, although still fundamentally painted in egg tempera. 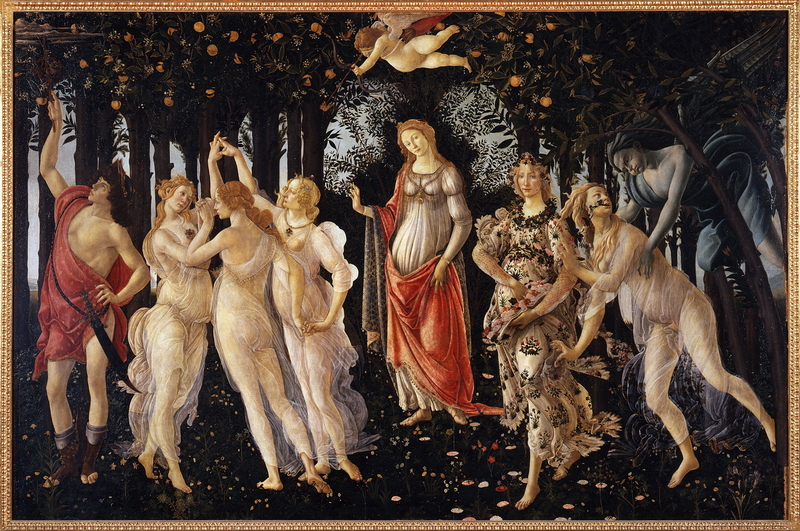 Sandro Botticelli (Alessandro di Mariano di Vanni Filipepi), Primavera (Spring) (c 1482), tempera on panel, 202 x 314 cm, Galleria degli Uffizi, Florence. Wikimedia Commons. By the end of the fifteenth century, many studios had changed to oils. 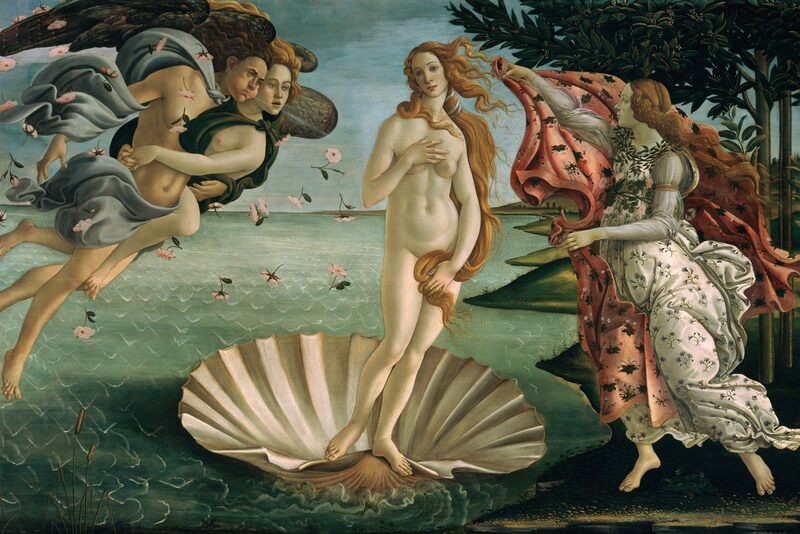 Among the last large egg tempera paintings are Botticelli’s Primavera (above) and The Birth of Venus (below), from the 1480s. The craft labour involved in producing these large works must have been great. Although Primavera was painted on panel, Venus was on canvas, which must have made it far more manageable given its size of nearly 2 x 3 metres. 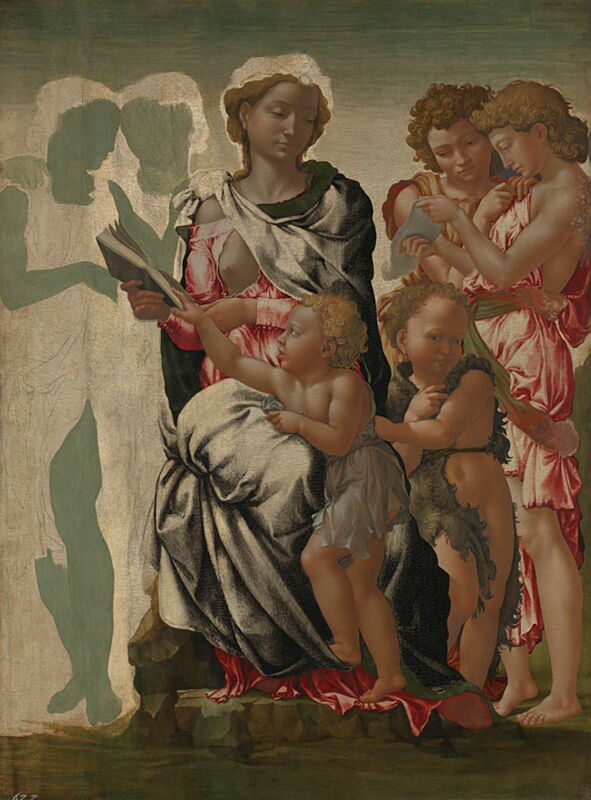 Michelangelo (1475-1564), The Virgin and Child with Saint John and Angels (‘The Manchester Madonna’) (c 1497), tempera on wood, 104.5 x 77 cm, The National Gallery (Bought, 1870), London. Courtesy of and © The National Gallery, London. In the closing years of the fifteenth century, Michelangelo kept to the hallowed tradition of egg tempera on wood in this incomplete painting of the Virgin and Child known now as The Manchester Madonna. This shows how he painstakingly completed each of the figures before moving onto the next, and the characteristic green earth ground. By this time, the only common use for egg tempera was in the underpainting before applying oils on top. This remains a controversial practice: performed on top of gesso ground it can be successful, but increasingly studios transferred to oils. Egg tempera didn’t completely disappear, though. With so many fine examples of how good its paintings both look and age, there were always some artists who chose it over oils. 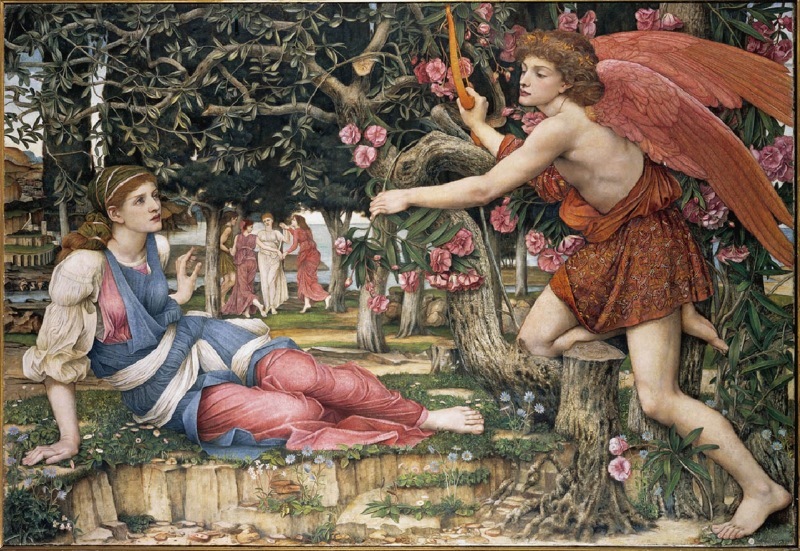 John Roddam Spencer Stanhope (1829–1908), Love and the Maiden (1877), tempera, gold paint and gold leaf on canvas, 86.4 cm × 50.8 cm, Fine Arts Museums of San Francisco, San Francisco, CA. Wikimedia Commons. Some nineteenth century movements which aimed to return to the more wonderful art of the past experimented with egg tempera again. In the late 1870s, John Roddam Spencer Stanhope started to paint in egg tempera, and made one of his finest works, Love and the Maiden (1877), using the ancient medium. 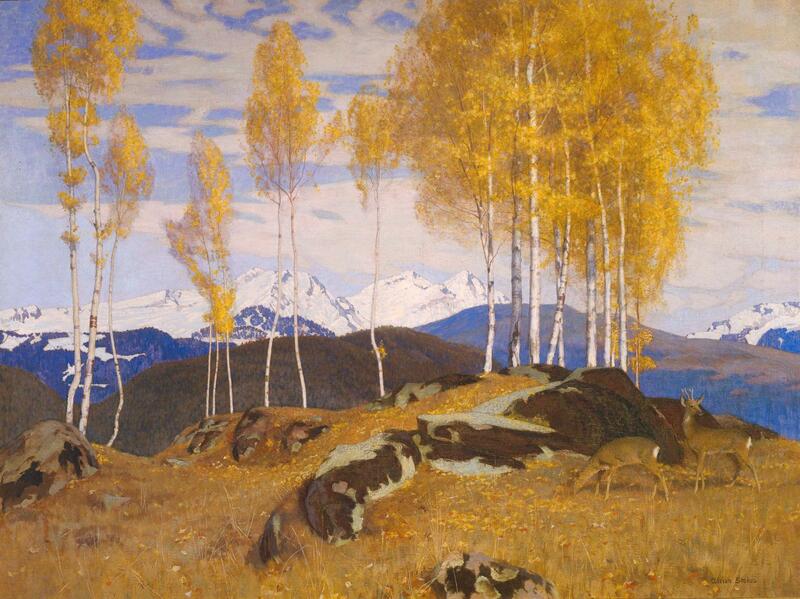 A later exponent who was rigorous in his technique was Adrian Stokes, who used it to great effect in this landscape of Autumn in the Mountains in 1903. But for my taste, the greatest painter in egg tempera since the Renaissance has to be one of the major artists of the twentieth century: Andrew Wyeth. As his works remain in copyright, I recommend that you browse his official site, where you can see just how effective egg tempera can be in the hands of a great master. It may not be as popular as in the past, but egg tempera still has a great deal to offer. Posted in General, Life, Painting, Technology and tagged Aretino, Botticelli, d'Arezzo, della Francesca, Duccio, history of painting, Masaccio, Michelangelo, painting, Piero, Stanhope, Stokes, tempera, Uccello, Wyeth. Bookmark the permalink. My mother painted murals on the drug store windows every Advent. She used tempera paints and sometimes incorporated egg. (Baskets of open jars of egg tempera left in a car in the Lowcountry sun, even in winter, can release a smell.) She also somehow included ivory soap in the process to facilitate the washing away of the mural after the first of the year. Thank you. That sounds ingenious and very practical. The washed windows sparkled. The murals drew a lot of attention, too. People still remember them…and her.